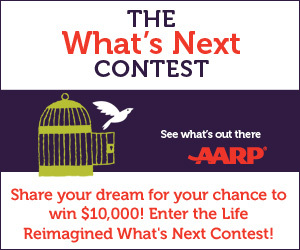 AARP has a new Life Reimagined’s What’s Next Contest where you can express your goal or dream that you have always wanted to achieve. You will have a chance to win $10,000, or $1000 if you’re one of three finalists. Whether it’s planning to run a 5k or going back to school, we all have dreams to achieve, and anyone (18) and older can enter! You are asked to provide basic information and to describe in a 200 words or less essay a goal or dream you have always wanted to achieve. This could be a fun way to earn some great prizes, but even if you don’t win, it’s fun to share your story and hear about others’ too!